John Gallagher has owned Bike Express in New Milford since 1985. Bike Express owner John Gallagher has provided bike enthusiasts with his expertise in bike sales and repairs for more than three decades. “Anything having to do with a bike, we either have or we can get it,” said John Gallagher, who has owned the shop in New Milford for 33 years. Gallagher not only greets customers and can offer sage advice on all things bike related, but he gets his hands dirty in the business’ repair shop. “There’s a chance you are going to get grease prints on your receipt,” he said. The 14 Bridge St. shop sells bikes, gear and accessories, and offers tune-ups and repairs. In addition, the shop also sells, repairs and provides accessories for skateboards. 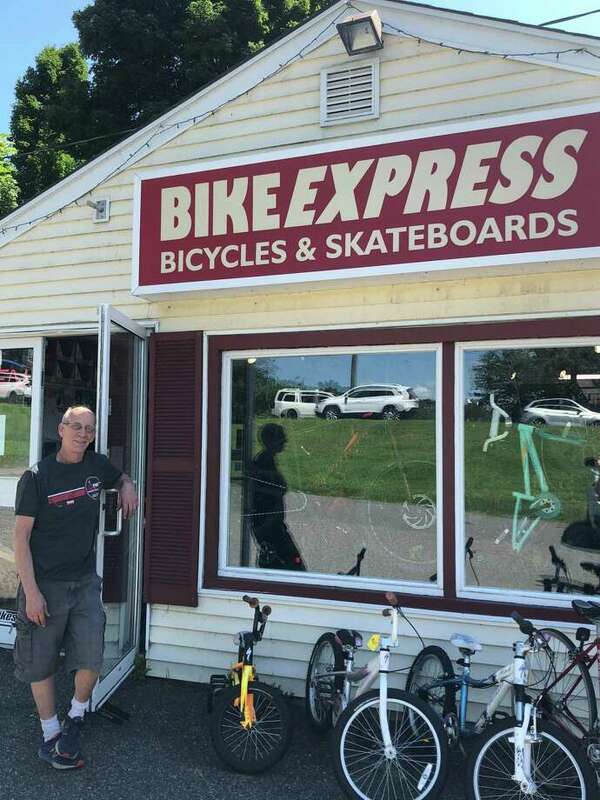 “I like being able to walk in and put my hands on an item of interest, talk to the owner and get opinions,” Jeff Winter, of Danbury, said of why he is a faithful customer at Bike Express. Cyclist Peter Feller, of Roxbury, a customer for about 10 years, praised Gallagher for his honesty and experience. Gallagher, who was a cyclist and raced for four years while living in California years ago, and his staff cater to customers of all skill levels and needs, including bike enthusiasts, families and serious cyclists. Lisa Cornelio, of Warren, who is a tri-athlete and cyclist, bought her first bike from Gallagher in the 1990s and has remained a loyal customer. “I send everyone I know to him,” she said. Cornelio described Gallagher as a “great resource” who is thoughtful and patient with customers of all skill levels. Gallagher emphasizes the importance of an individual riding the appropriate bike for their size, she said. The shop sells a wide range of bikes, including mountain, road and hybrid bicycles, as well as electric power assist bikes. Bikes are available in all price ranges but max out at about $4,000 at the shop. Gallagher has seen the evolution of the bike industry. In the 1980s, he mainly sold bikes and parts, while also operating a repair shop. But about 10 to 15 years ago, the repair part of the business picked up. “I still enjoy the act of physically repairing bikes, and talking to the people,” he said. The majority of the shop’s customers are casual cyclists, who stop by about once a year to get their bike serviced. Repairs range from general tune-ups, to particular fixes for brakes, gear shifts, tires and tubes. The shop provides fixes for tires and tubes while a customer waits. All other repairs are usually completed in a day, depending on the day a bike is dropped off. Customers who purchase a bike will receive one year of free service. Free installation is provided for bike racks. Staff will also offer tips on how “not to lose (a bike) on the highway,” Gallagher said with a smile. After living in California and actively cycling, Gallagher headed back to Connecticut and worked in the bike industry in Willimantic. Then, in 1981, Gallagher opened Bike Express in Danbury and shortly thereafter, his brother came aboard. Four years later, Gallagher ventured out and opened a second shop in New Milford. Gallagher said a few of his customers are former BMXers who used to frequent his shop in Danbury. The Bike Express, located at 14 Bridge St. in New Milford, is open seven days a week the majority of the year, from spring through fall. Hours are Sundays from noon to 4 p.m., Mondays through Thursdays from 9:30 a.m. to 5:30 p.m., Fridays from 9:30 a.m. to 7 p.m. and Saturdays from 9:30 am. to 5 p.m. The shop is open four days a week during winter. For more information, call 860-354-1466 or email info@thebikexpress.com.